Located just north of Hilo, in the breathtaking Hamakua Heritage Corridor, this property has outstanding views of the Pacific Ocean from every corner! You can watch the sunrise every morning and during whale season you can see and hear the whales breaching and calling. This newly built home is large, comfortable and has all the modern amenities. It is a 2 story home with 3 bedrooms downstairs and the upstairs has the living, dining and full kitchen with double french doors that open to a large Lanai with deck chairs for your fun and relaxation. Grab you favorite drink and enjoy the sweeping ocean view. The year around tread wind keeps this area cooler and less humid than the rest of the island. You can buy island grown fruits and vegetables at the nearby farmer's market and cook delicious meals in our kitchen while looking at the ocean. Our UV- filtered rainwater tastes better than bottled water. Your children will love feeding and petting our friendly sheep on the property. In the evening, you can make yourself comfortable in front of the flat screen HDTV and watch your favorite channel or take advantage of the blue-ray DVD player. With newly updated (3/1/18) internet with WiFi, you can also stay connected to your friends and family.. Built on 2 lush green acres, this home provides you with privacy, security and all the peace and quiet you need. Located close to the Hawaii Belt Road that circles the entire island, it is easy to find at night and convenient for your sight seeing. Centrally located to both Hilo and Kona and all the major attractions - Hilo 15 minutes, Waimea/Waipio 30 minutes. Famous Akaka Falls Park and Hawaii Tropical Botanical Garden are only minutes away. It is a drive away to the most visited Volcano National Park and the beautiful Black Sand beach. There are many beautiful sites on this island to visit but I assure you that you and your family will end up spending a few days just hanging out in this home. My family is very excited to make our home available to you for your stay on the Big Island. We are offering very low rate to our guests!!! Additional discount is available if you stay 7 days or longer. The whole family joined us in this home and we all had a great time. We enjoyed the views, had good space for all of us, and were able to get to many places on the island from this location. I would go again. Clean with great views and comfortable beds. Loved the interaction with the animals in the morning. Pretty views for sunrise and morning coffee! Photo's are current. A bit hard to find after dark, but ask for printed directions if you will arrive after sunset. I did, and it made the driveway easier to find then just looking up google directions. 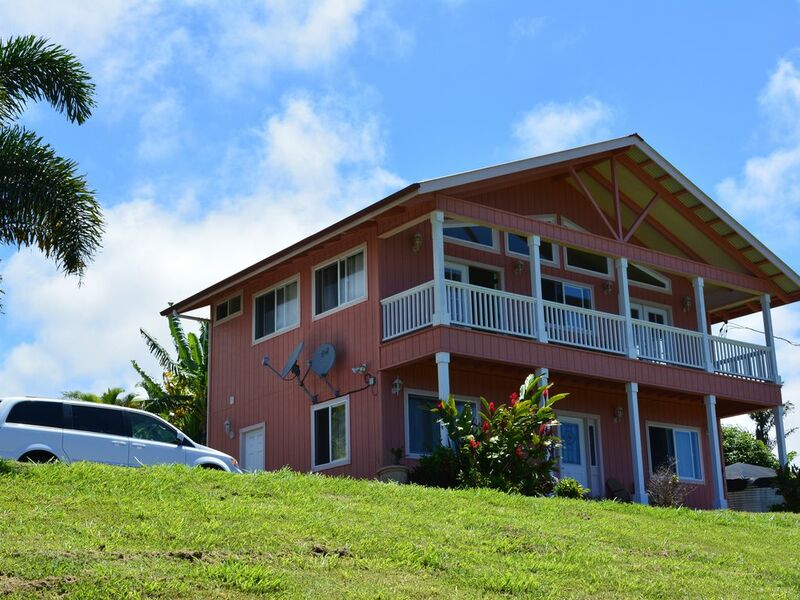 Perfect location on central coast between Hilo and Waimea. Easy to find just off the highway. House had everything you could need and plenty of room. Enjoyed the second floor veranda looking out at the ocean. My group of two stayed in the house for a long weekend and we loved it. Everything worked for us - INCREDIBLE views from the sweeping lanai; cool nighttime breezes making sleeping pleasant; very well appointed living areas with all the comforts of home; and maybe best of all, incredible peace and quiet! Sitting on the lanai we could only see the ocean, forest, and some very friendly sheep that let us feed them grass. I could have done a weekend of sitting on the lanai and would have loved it. Highly recommend! This home is perfect for checking out the Island. It is spacious, clean and comfortable. The kitchen is wonderful for preparing meals to eat out on the deck. Being able to do some laundry is also an added bonus. It is close to Hilo for shopping, the Volcanos National Park and the Kona side of the Island with a bit of a drive. If you want privacy and seclusion with great amenities, this is it! With all great off the beaten path locations, be sure to stop for food and drinks before you drive up. If you fly into Kona late in the evening, I would recommend a night in Kona to rest, it is still about an hour and 1/2 away. I am grateful I printed the instructions from the owner, since my apple maps was placing us too far north of the house. Once you find it, it's obvious where to go, but in the dark it might be challenging. We will definitely be staying here on our next trip to the Big Island! It has a great view, but weather was poor for our stay. They advertise as nearly built home however 10 years old is not yearly built in our opinion. Our displeasure was that you over looked a field of six sheep, but ribs showing was not pleasant to watch animals that appear starved. Address is blocked by high weeds and difficult to identify. Would really be difficult at night. Thank you for being our guests. I am sorry that you had bad weather during your stay. You took issue with me calling our home "newly built" :-). It hasn't been 10 years yet and the house still looks and kept like new. I appreciated your concern about my sheep but calling the Humane Society was a little too aggressive in my opinion. I wish you called me first and expressed your concern as most guests do about any concern about the house or service. The visit from the Humane Society officer startled the current guests but they were nice enough to call me straightaway. I spoke with officer Maria and she told me that she found the sheep in good health and spirit. They had plenty of grass and feed as well as fresh water. I know your intention was good and I appreciate it.